Recently launched Oneplus 5 is the most affordable flagship right now with all latest features. While Oneplus 5 is doing well with sales, it is also receiving good support from Android developer community. Already, Root for Oneplus 5 is achieved only within a couple of days after its launch. And Now, in less than 2 months, most of the popular Custom ROMs got ported to the Oneplus 5, making it even more popular. If you are Oneplus 5 user and not yet rooted, then refer to our detailed guide on How to Unlock, Flash TWRP and Root your Oneplus 5. 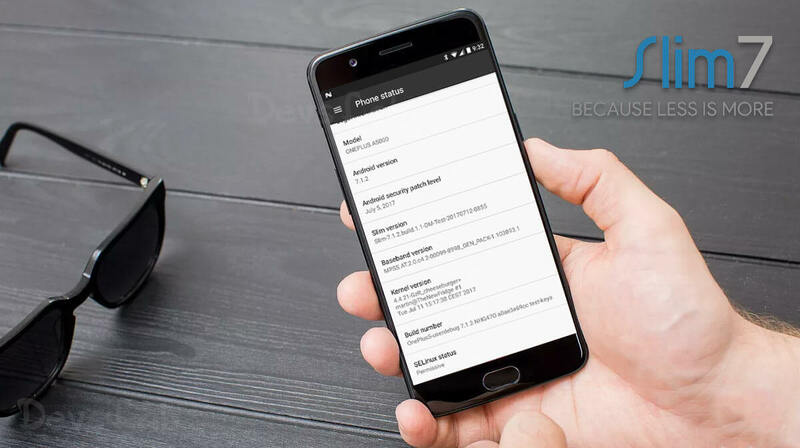 Recently, SlimRoms released the stable builds based on Android Nougat 7.1 for Oneplus 5. SlimRoms is a well-known AOSP based custom operating system in the world of Android ROMs. Slim 7 is the project name of SlimRoms for the ROMs based on Android Nougat. It offers a slimmed down Android OS which will maximize the usability of the smartphone. It is also a feature rich alternative to stock android with many customizable options. The beauty and smoothness of SlimRoms clearly represent the effort of Slim team. So, if you are Oneplus 5 user and interested in flashing Slim 7 ROM, we will guide through the process. Oneplus 5, Rooted with TWRP custom recovery. Please make a TWRP Backup before proceeding. Caution: Unlocking of the device may void warranty. Always have a backup of your personal data as a precaution. We are not responsible for any damage done to your device. Various Status bar tweaks and customization. Slim Launcher and Much more. Step 1. Download the latest ROM zip file of Slim 7. Step 4. Now, get back to the main menu and Tap on Install. Step 5. Navigate to the Slim 7 zip file and Flash it. Step 7. As described above, Also Flash GApps package. Step 8. Reboot the system. First boot may take some time, don’t interrupt the boot process. Note: If you are previously on Slim 6 release and want to update to Slim 7 then no clean flash is required. Step 3. Tap on Install, Navigate to the Slim 7 zip file and Flash it. Step 5. Reboot the system. Step 6. Please give some time during the first boot. That’s it. Now your Oneplus 5 will boot on the Silm 7 ROM based on Android Nougat. During the first boot, setup your device and add your Google account to get back all your contacts and App data. For any queries or issues, please comment below.